The "motzetta" (or "mocetta") is produced in the Valle d'Aosta region. 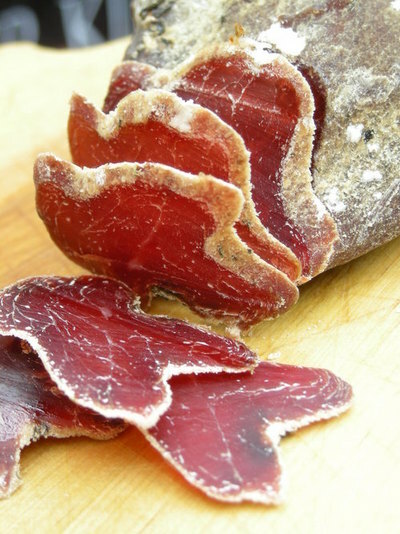 It is basically a dried meat of cattle, chamois, deer or wild boar. It was born from the ancient need to store long the meat for the winter needs of the family. Made with low-fat whole cuts, is left to macerate with mountain herbs, salt, spices and other natural flavors for about twenty days, completely covered by brine and pressed by a weight. The final stage of this process is the seasoning, which lasts from one to three months. The motzetta is considered a treat, perfect as a starter. It does not need any dressing, because its taste, infused with local flavor, is already complete by itself. You can serve it thinly sliced accompanied with toasted and buttered slices of typical rye bread. GustoRaro.com the real Italian website for culinary art and italian food culture. Surf it & Buon Appetito! Locoprice SL - Copyright. Simple theme. Powered by Blogger.